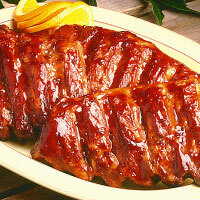 Put spareribs in saucepan, cover with water. Bring to boil, remove rom heat, drain. Put in baking dish in single layer. Combine pineapple juice, honey, soy sauce, lemon juice, chutney, tomato sauce and finely chopped ginger. Pour over ribs, let stand at least 1 hour; drain and reserve marinade. Mix cornflour to smooth paste with water, add to reserved marinade, stir over heat until mixture boils and thickens. Put ribs on wire rack over baking dish. Bake in moderate oven 30 to 35 minutes or until tender, brushing occasionally with the sauce. Serve with remaining sauce spooned over.